Summary (from the inside flap of the book): Nazi Germany. "I should have been born yesterday, but that's not what I wanted. The date didn't suit me. So I've stayed put. Motionless. Rigid. Of course that means a lot of pain for my mother, but she's a brave woman, and she's putting up with the delay without complaint. I'm sure she approves of my tactic. My wish, the first of my future life, is to come into the world on April 20. Because that's the Führer's birthday. If I'm born on April 20, I will be blessed by the Germanic gods and seen as the firstborn of the master race. The Aryan race will henceforth rule the world." In the Lebensborn program, carefully selected German women are recruited by the Nazis to give birth to new members of the Aryan race. Inside one of these women is Max, literally counting the minutes until he is born and can fulfill his destiny as the perfect Aryan specimen. 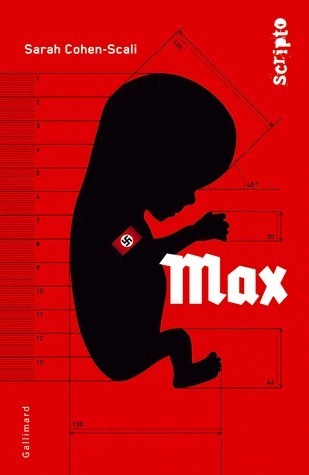 Max is taken away from his birth mother soon after he enters the world. Raised under the ideology and direction of the Nazi Party, he grows up without any family, without affection or tenderness, and quickly becomes the mascot of the program. That is, until he meets Lukas, a young Jewish boy whom he knows he is meant to despise. Instead, the friendship that blossoms changes Max's world forever. Review: I started writing this review about half way through the book and I don't want to lose my initial thoughts. So, here are my original thoughts followed by what I thought by the end. My friend Sherri recommended this one to me knowing how interested I am in World War II YA novels. I didn't realize that it was originally written in French until just before I began reading it, but the translation was done well and didn't detract. However, I had a difficult time with the voice of the narrator. Max begins as a baby in the womb, a day away from birth, and he talks as if he is all-knowing. He knows things adults maybe know and he hasn't even entered the world yet. This continues as he is an infant, toddler, and young boy. The concept and storyline are good, however, and show an aspect of Nazi Germany that I didn't know much about: lebensborn. I knew that mothers were revered and rewarded for producing Aryan children, but I didn't know about the baby-making factories (women whose sole purpose it was to give birth), the stealing of Polish children who looked Aryan, or the efforts that they went to in order to create the master race. Once Max is in the children's school and is the "model" student whose job it is to help the Polish children become good German citizens, he meets a Jewish child and befriends him. This relationship helps Max slowly change. His voice becomes much more tempered and therefore, easier to read and enjoy. As the war winds down Max and Lukas (his friend) experience Berlin through bombing raids, the arrival of the Russians, and, eventually, connecting with the Americans. This second half of the book is so much better than the first in my opinion. I also liked the Author's Note at the end where she reveals the history to back up the story, some of her sources, and especially that she references the film Europa! Europa!, which has always been one of my favorites that I did think about while reading the second half of this novel. So, I recommend this one with the caveat that you will need to get beyond Max's voice for the first half.